70 Hand Cleaning Wipes Per Dispenser Bucket. Water-less cleaner fortified with an emollient and natural oils. Quick and easy to use, just wipe and discard. A water-based hand and surface cleaner that cuts through tar, grease, wax, ink, paint, lubricants and adhesives. Aggressive, citrus scented towels are industrial strength, yet gentle enough for your hands. Fortified with emollient and natural oils. Use them for every job from loosening and dissolving tough grease, grime and oils from hands and surfaces to equipment and tools. 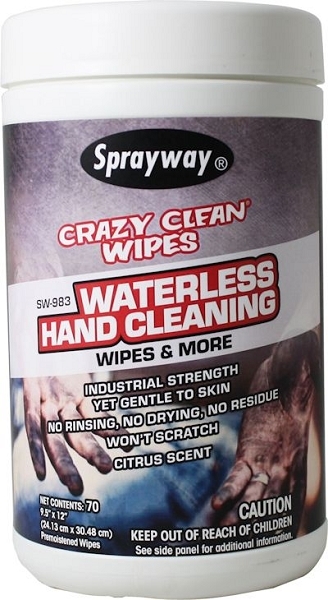 Great for on the job hand cleaning when a water source is not available.